Julia Marchetti ’18 and Erin Burke ’18 pose with Bickmore's birds. 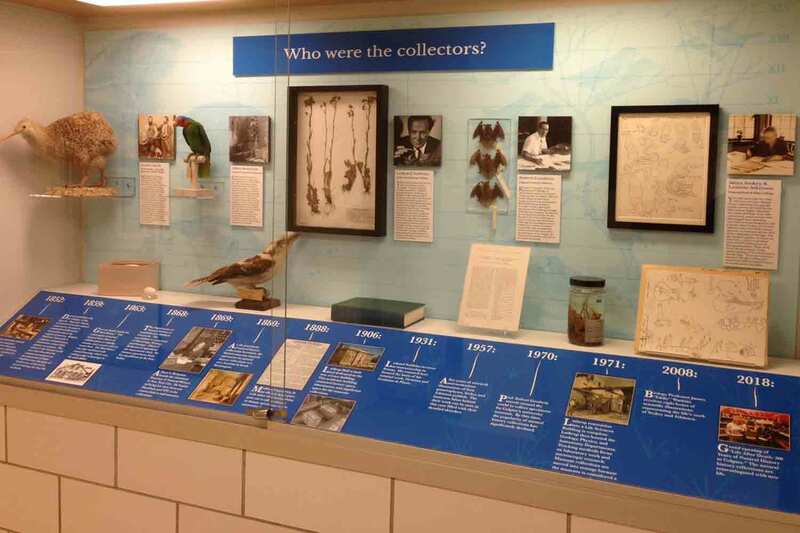 The first case in the Olin Hall exhibit displays the timeline of specimen collecting at Colgate. 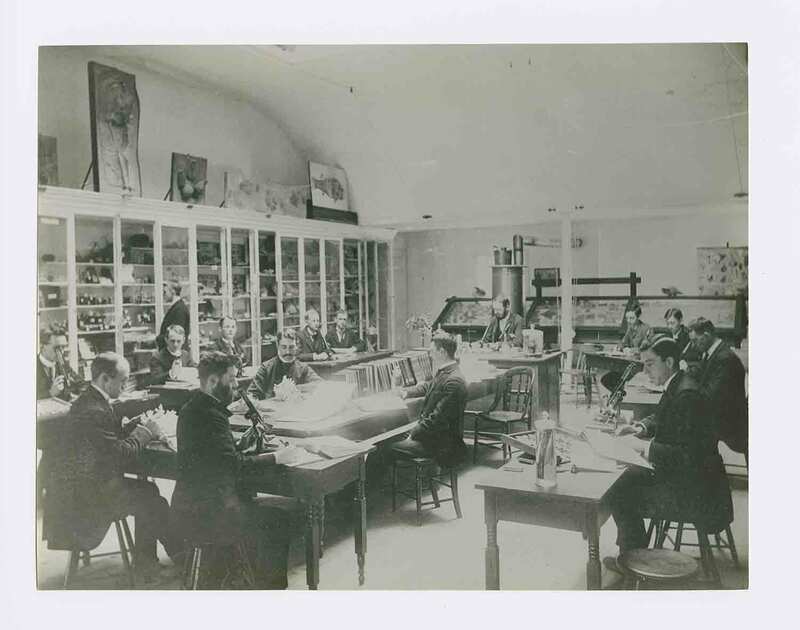 Archival image of Colgate students using the collections. This Olin Hall case explores why and where collectors and scientists were obtaining specimens. It contains a "cabinet of curiosities" designed by Marchetti and Burke and hand built by museum technician, Paul Voss. 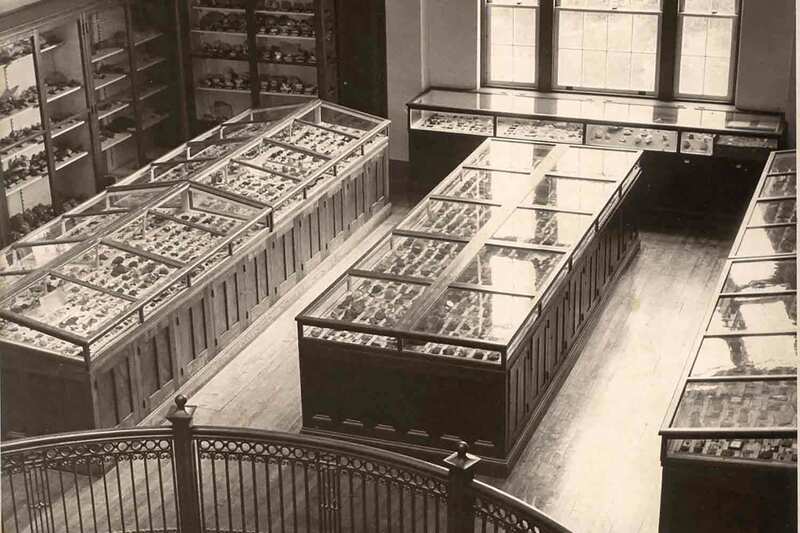 Colgate's natural history and geology collections were once housed in glass cases in Lathrop Hall. 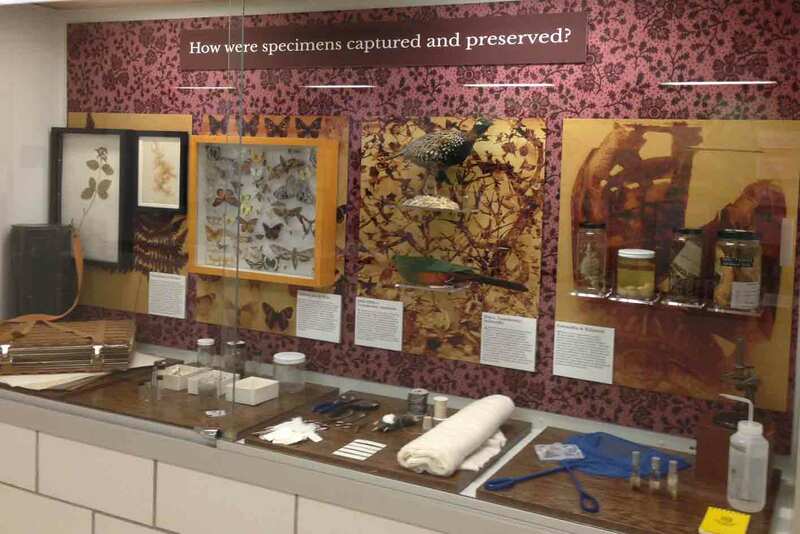 Olin Hall case displaying methods of specimen preservation and two of Bickmore's birds. 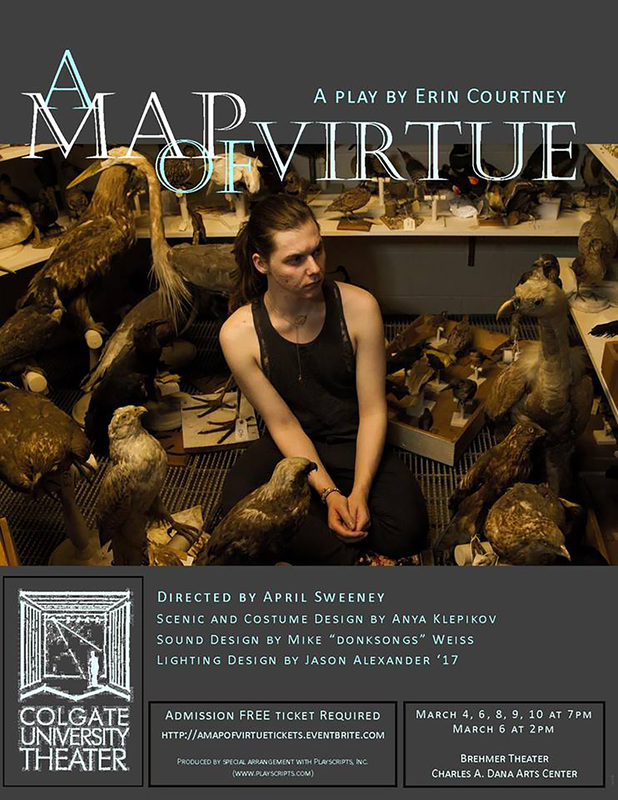 Theater major Tanner Holley ’16 posed with Bickmore's birds for the poster promoting the play A Map of Virtue. Colgate is home to a vast collection of natural history specimens. These specimens have been used extensively in teaching throughout the last 150 years, beginning in 1868 with their arrival in the luggage of Albert Bickmore, former professor of zoology and geology. Bickmore, who later founded the American Museum of Natural History in New York City, brought with him a large collection of stuffed birds, which he collected and preserved throughout several years in the East Indies and Asia. This important connection to one of the world’s preeminent natural history museums gave rise to two very different exhibitions on view in celebration of Colgate’s Bicentennial: The Beauty of Sculpted Minerals, located in the Ho Science Center’s Robert M. Linsley Geology Museum (see related story), and Life After Death: 200 Years of Natural History at Colgate, an interdisciplinary exhibit housed in the glass display cases in Olin Hall. Throughout the years, Olin’s display cases have been home to a number of different objects, animals, and plants, ranging from tropical ferns to living animals. Watkins applied for a Bicentennial Grant and turned to professors Elizabeth Marlowe (art and art history) and Tim McCay (biology) for assistance in fleshing out Life after Death. Julia Marchetti ’18 and Erin Burke ’18, developed the vision for the redesigned cases. Marchetti and Burke were interested in answering four major questions. Who (besides Bickmore) collected the specimens and when were they collecting? Why and where were they collecting? How did they capture and preserve specimens? How have the specimens been used in teaching? The result is a fascinating display composed of preserved specimens — including jars of salamanders, pressed plants, taxidermied animals, dried insects, detailed explanatory labels, and images from Colgate’s archives. There are seven themed cases lining the hallway. Four cases explore the collections’ histories with focus on the individual collectors and their contributions to their respective fields. One case details different methods of specimen preservation. The birds were preserved with arsenic in the second half of the 19th century and must be handled with gloves, and many of the reptiles were submerged in formaldehyde. 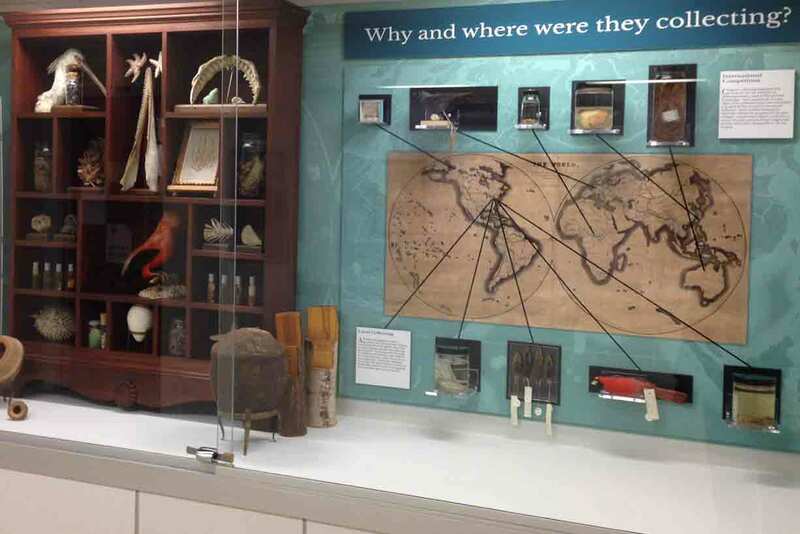 Three cases delve into the use of specimens in teaching at Colgate. 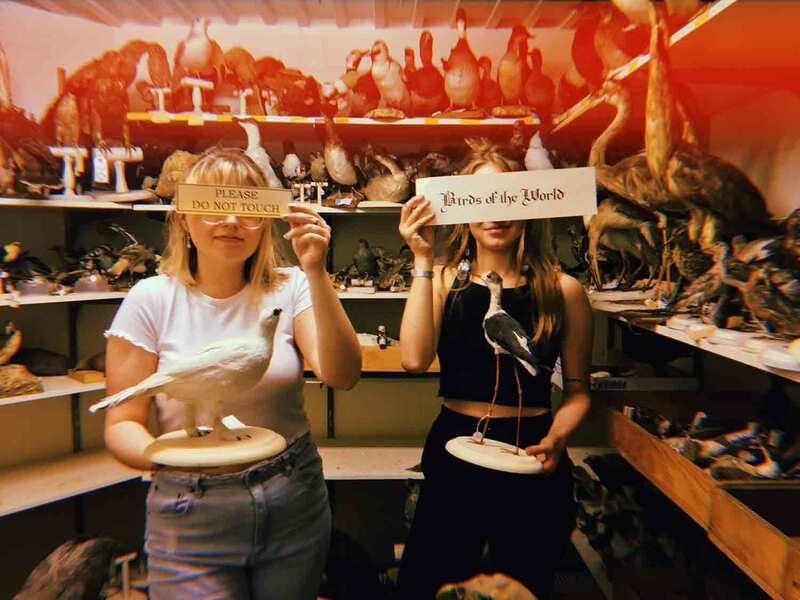 In the interdisciplinary case, art students use the preserved animals for sketching, and Bickmore’s birds were used in a photo shoot for a poster promoting a student’s theater project. Watkins likes this case the best, “It shows the emergent value of these collections when put into the hands of students at a liberal arts institution like Colgate,” he said. Marchetti is currently pursuing a master’s degree in historic preservation at the University of Pennsylvania and Burke is working on a master’s degree in museum studies at the University of Glasgow. The exhibit is on permanent display and serves as an ongoing testament to the tradition of interdisciplinary learning at Colgate. The remainder of the collection is housed around the corner in Olin Hall’s Natural History Museum of the Chenango Valley and is available to faculty, students, and visitors.